While stance and gesture were primary tools in portraying character, there was also facial make-up and expression. 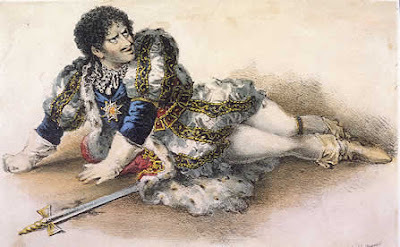 The positioning and movement of the eyes were especially important...one of Edmund Kean's strong points was his unusually short eyelids, which meant motions and expressions of his eyes were easily seen. 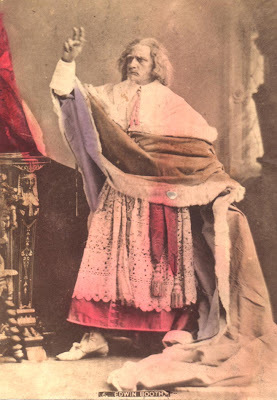 Edmund Kean himself, as Richard III. Charles Fechter "showing the whites of his eyes", as it was called, as Hamlet, with his gravedigger friend similarly using his optics. 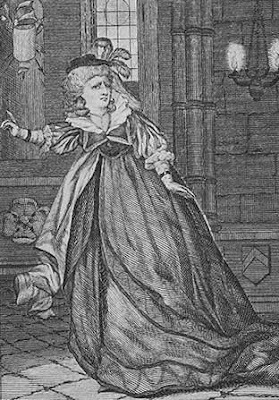 An early example -- Sarah Siddons as Lady Macbeth. A pause to take a stance and direct one's eyes off character or off stage created a frozen moment of emotion. Madame Celeste freezes another moment. Note the typical positioning of the face away from the body to increase mood. From the sublime to the ridiculous...unknown actors silently emote. 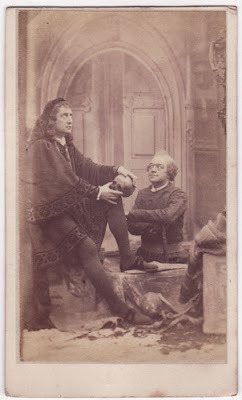 Edwin Booth in one of his more famous roles as Cardinal Richilieu. Notice the eyebrows' effect in exaggerating the eyes, reminiscent of Kean. Another Hamlet, this time Beerbohm Tree. You can see that actors who can show white completely around the eye were better equipped for expressing strong emotion. 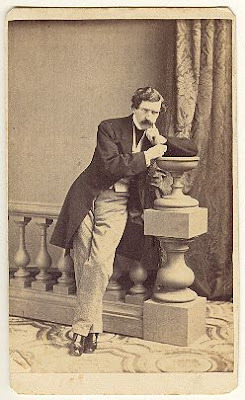 A carte de visite (sold in theatres and stationery stores) of light comedian E. A. Sothern in a sober mood. Maude Adams, showing demure charm by the feminine stereotype of "looking through the eyelashes". Hello, I am an international student who is studying IB Theatre. I have to write a research paper about Victorian melodrama. I was wondering if all the information on this blog article is about Victorian melodrama and whether or not I can use the information on your blog for my paper. Also, if you have any additional information about this type of theatre, could you email them to me? Thank you very much! I found the information on this blog page extremely helpful for my research paper! On your blog, I saw that you had a link called Stage-Land by Jerome K. Jerome. I was wondering whether or not this was a reliable website to find information about Victorian melodrama. Thank you again! Hello, Rong. I'm so pleased you find this blog useful. The Jerome K. Jerome link is an electronic form of his 19C book "Stageland", a humorous account of his life as an actor. It is an excellent primary source, but do remember he is writing for humor. Other sources I recommend are listed on the left side of my blog. 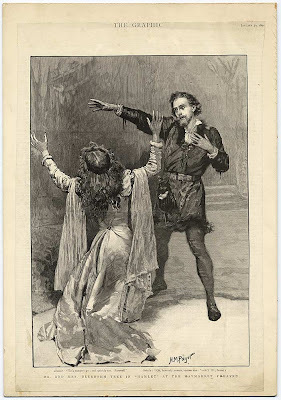 I highly encourage you to read Michael Booth, David Grimsted, The Cambridge Compaion to Victorian and Edwardian Theatre, Melodrama: The Cultural Emergence of a Genre, ed. Michael Hays. You should also read some of the plays: there are several anthologies on Amazon, also many of the plays are online. "Lights o' London" is good, also "Ten Nights in a Barrom", "Clari" and "Black-Eyed Susan," but any good bibliography can guide you. I don't have an email address, but if you send one to me, plus any specific questions you have, I'll respond. Also, I'd very much like to see you finished paper. 1. 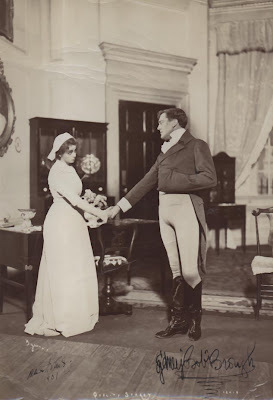 Is there a certain way Victorian melodrama actresses and actors walk when on stage? If so, how do they walk? 2. How do heroines express distress or panic? 3. 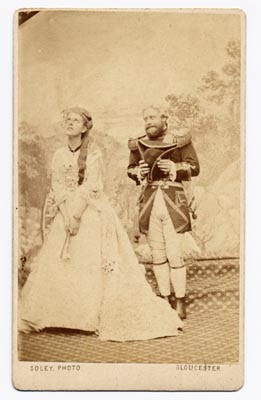 According to your blog post, Victorian melodrama actors never turn their back to the audience and are rarely in profile. How to they communicate with other actors on stage? 4. 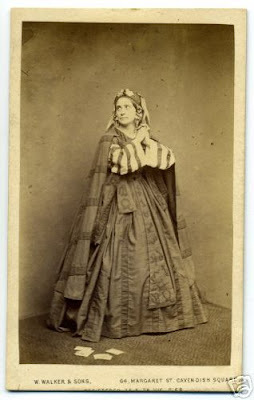 I read that Victorian melodrama actors focus more on emotional situations rather than developing their character. What does this mean and how does this work? If you could also provide me with other information about Victorian melodrama, I would be extremely grateful. Hello, Rong. Here are some answers for you. 1) See "deportment" regarding walks. Practically speaking, an actor's footsteps echoed in old-fashioned theaters, so it was better not to walk and talk at the same time, or walk when other actors were talking. Specific types of walk varied with gender, age and personality of the character. Actor training did teach a particular type of walking, often treading on the balls of the feet first. One manual suggests the actor think of the foot as the bottom part of a wheel, rolling the foot across the stage when striding. This would distribute the weight more evenly, avoid clopping or stomping sounds, and provide better balance. 2)For distress or panic, look at "fear" under my posts on emotion. 3) I would not say actors NEVER turned their back to the audience or spoke in profile. But the main purport was to face and address the audience. Before electronic sound systems and at a time when audiences were large (in the thousands) and noisy, to ensure being heard, an actor needed to face out and project loudly, so full face presentation was normal. 3/4 presentation, with the body turned towards the fellow actor, also worked. Sometimes an actor was turned to speak directly to a character, but it wasn't considered absolutely necessary. Please browse through the photos I have posted on this blog and notice how pairs of actors are posed. Rarely are they in profile. 4) Melodrama is thin on character development. It is pitched high in emotional affect, and consists of scene after scene of dramatic climax. Actors therefore concentrated on their portrayal of stock character and wanted to communicate to the audience love, despair, anger, or fear, not an arc of development from boy to man, or coward to hero. An actor would usually develop a "line of business", or specialization in characters, such as heavy villain, wise old man, ingenue, or light comedian. This helped them in a profession where they might be peforming one play, rehearsing another, and studying up lines for a third. Reading the recommended books will help you understand this system more thoroughly, especially works by Michael Booth or Russell Jackson. It would also benefit you to read more than one melodrama. It's difficult to appreciate the genre from one example.